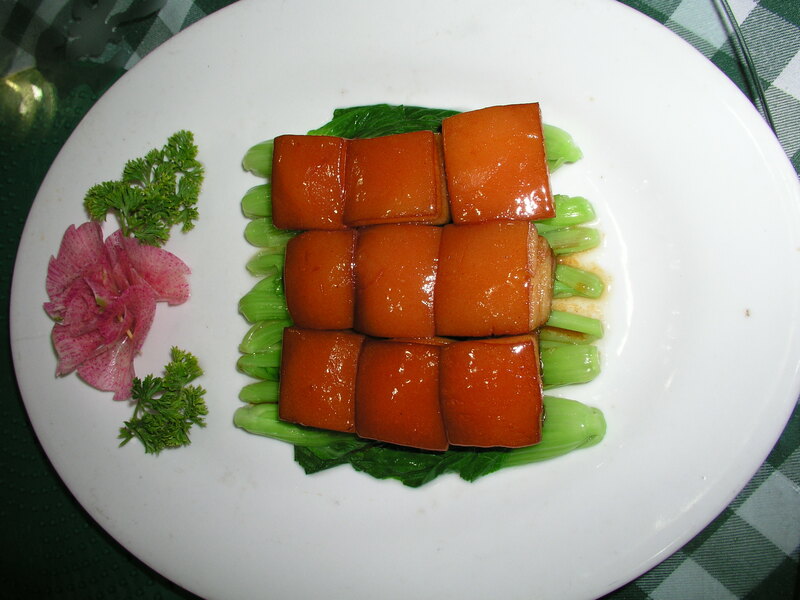 According to a report in the Daily Telegraph, a local government in Hunan is issuing precise instructions for making Mao’s favourite dish, Red-Braised Pork (hong shao rou 红烧肉), in an attempt to stem the flood of imitations. They are also attempting to standardise recipes for other dishes enjoyed by Mao, including stir-fried pork with peppers (nong jia chao rou 农家炒肉) and steamed fishhead with chillies (duojiao zheng yutou 剁椒蒸鱼头). chillies, star anise and ginger, and enhanced by some juices of fermented beancurd. Who can say which is truer to Mao’s own tastes? The other thing is that local officials have said that true hongshao rou can only be made with the meat of some rare breed of pig from Ningxiang County. This I found hilarious, because of all people, Mao Zedong, a notorious lover of coarse grains, wild vegetables and robust peasant food , seems unlikely to have been concerned with the precise sourcing of his ingredients. I’m sure he would have left that to the refined, bourgeois gourmets he so despised. You can hear me talking about this story on the BBC World Service this afternoon, here – it’s the last item in the programme. I customize all my cooking for my taste. Who doesn’t? Some things just never change. Always read to help and expect people being grateful but only to be slandered to his family. Its not about customisation or non-customisation! You can customise all you want. I own a takeaway and I customise my dishes all the time thats why my food is not authentic and there are many cheats in China like me dude. Understand? Take Kinka Ham(an expensive type of ham)for example. This particular type of ham is reared from pigs that are breed in a certain region in China (China regions differs greatly in terms of climate/environment/what-they-eat & so does the people ie. some places never rains and some rains all the time; northern regions are cold and people eat alot of carbohydrates – these people are taller, therefore it goes to say animals can vary from region to region. The recipe for Kinka must be standardised in order to hold value. You can’t simply sell(or substitute) cured ham for the same price as kinka ham right?? Yes we have been invaded for 3 centuries + the revolution + thousands of years of secret societies overthrowing different governments, which dragged us behind in many things. One thing we are not behind in and still far more advanced in is the depth of tasting/food. Remember back in the days when many people in the west thought banning smoking was absurd. How about now? Things are done for a reason. There are disparity between countries in terms of development. If you go back in time to 20-30 years ago you pick up on many mistakes right? Media tends to distort information and demonise other countries. I detest this kind of reporting because it would undermine their credibility. Restaurants which do not follow the correct procedures will not be allowed to title themselves as “authentically” Hunanese, said the guidelines. Understand? Comprende? Maybe you should try different types of pigs when you make the dish see if it tastes the same? Does UK chicken taste the same as HK Chicken? What about free range/corn fed. DO I need to draw a picture? Sheesh, lighten up, man. What’s your problem? Anyone finding anything at all to object to in this article has serious problems. I guess Mao would prefer the spicy version. 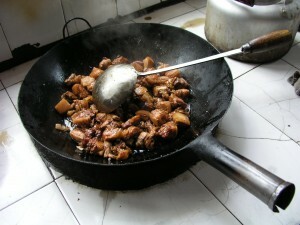 A friend of mine is from Hunan and this is how she cooks her red pork, just like her grandma. I, on the other hand, prefer the Suzhou style. All you need is cooking wine, soy sauce (the normal Chinese type, not light or dark), rock sugar and a dash of vinegar. No frying, no browning, no ginger, star anise or other aromatics.But you need to soak the meat first, blanch to get rid of scums, boil and simmer, then add the soy sauce to reduce. Finally add sugar to thick the sauce. It’s kind like Dong Po Rou but different. Purely personal preferance. 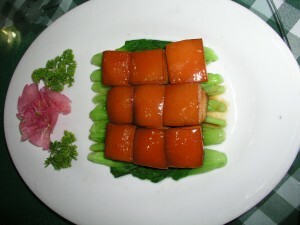 To make the best red pork, you need the best belly pork, marbled with many layers of fat and meat. As for the breed, I’m sure any well reared pork will do. Ignore that tom guy. I doubt if Mao would demand Ningxiang pork transported to Beijing just for him to eat. Made it tonight. Let it simmer very slowly till dark and sticky. Popped a few dried chillies in after an hour or so, just because I wanted an extra dimension having read this page. Very rich, of course, but smokily, caramelly good, especially with both the palm and rock crystal sugar. I have three of Fuchsia’s books, and love them, both to cook from and simply to read and enjoy.